Vive la France! Vive la RA�publique! Today the French celebrate ‘la fA?te du 14-Juillet’ or ‘la fA?te nationale’ which is known in the UK as a�?Bastille Daya��. 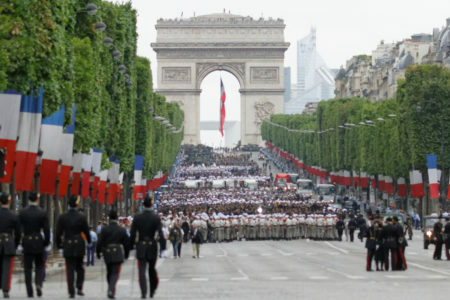 This is Francea��s biggest national holiday, celebrated annually in France and French-speaking regions around the world with parades, fireworks and parties. ‘La fA?te nationale’ marks the start of the French Revolution in 1789 and is one of the most important days on the French public holiday calendar. Under the reign of King Louis XVI many of those who opposed the monarchy were imprisoned in the Bastille, often without trial. In 1789 the problems of the country came to a head with high taxes, high food prices, the unfairness of the feudal system, and the failings of the monarchy. The public, including many who were starving, decided it was time to stand up against Louis XVI’s and his plans to raise the taxes further. Bastille, a symbol of royal rule, was attacked by around 300 revolutionaries, and this attack became known as the storming of the Bastille. A battle took place, the walls were pulled down, and the governor of Bastille was killed. This first act of defiance led to the abolishment of feudalism and the proclamation of the Declaration of the Rights of Man and of the Citizen, and marked the start of the French Revolution which was to end ten years later in 1799. What to say to French People? Ita��s important to remember not to say a�?Happy Bastille Daya�� or call it a�?Bastille Daya�� at all a�� this is the British term. To the French you can say “Vive la France! Vive la RA�publiquea�? To celebrate this special day for France Cactus is offering 10% off French evening language courses starting 19th July in 14 locations across the UK. Use code JCD10. Cactus also provides French language holidays and immersion courses in French speaking countries across the world and French Corporate Language Training globally. Posted on 14/07/2016 25/04/2018 Author Fay DrewryCategories French, Language NewsTags bastille day, france, French, french in france, vive la franceLeave a comment on Vive la France! Vive la RA�publique!